An activator, cleanser and stimulator for the heart chakra. Raises the energy vibration of emotional and astral levels to heal the astral body and emotional heart. Heals and returns fragmented soul parts, aids in soul retrieval, and aligns astral and etheric bodies. Heals karmic emotional pain and pain from past-life traumas. Encourages speaking and listening with ones heart and to realize the equality in relationships. Leopardskin Jasper has a trigonal crystal system. It is a secondary formation of the Quartz and oxides group of stones. It is mainly found colored in shades of red, deep tans and yellows. Its name comes from its patterns and colors which resemble a leopard's coat. Found mainly in South America, Mother Earth's paintbrush has embellished this stone type with quite a wide variety of patterns and colors. Formed in a sedimentary manner, silicic acid has soaked into clay or sandy rock creating a thick soup of suspended particles. When it has been blended quite well and happened slowly, we find the solid colors of Jasper. When the process has occurred quickly without a lot of mixing, and then crystalized quickly (its lime base is replaced by cryptocrystalline quartz), we are gifted with this beautiful variety. I have found holding a piece in each hand during meditation to provide a very grounded feeling. It has also provided extra focus and concentration in sorting out direction in daily life. Like most gems, its most beneficial effects are found when in direct contact with the skin. It is slow acting and can be used for very extended periods of time. Leopardskin Jasper provides an open mind so we can discern what we really need from what we think we want. It also helps to change the areas in our aura to reflect those needs and helps attract what is required. Perhaps by bringing us a new friend with a different point of view, discovering a book that enlightens our thinking, our 'aha' moment can be provided from many forms and outlets which we can only discover from having an open mind. Leopardskin Jaspers circular patterns eminate energy very smoothly providing balance to areas requiring it. In leveling out our physical energies we can discover how each part of our makeup relies on every part to function correctly. When we correct a physical imbalance, our emotions will follow with balance as well. Leopardskin Jasper, like many Jaspers, is slow acting and will need to be used for long periods of time. If you have been trapped in negative thought patterns and seem to attract people who don't have your best interest at heart, over time you will find a reversal of that disharmony. Eventually you will repel those negative thoughts, patterns and influences and find you are drawn to the positive side of things. The important thing to remember is that we haven't arrived to where we are at over night, and using this stone isn't an instant transporter, but used with consistency, we will arrive at a happy and positive destination. 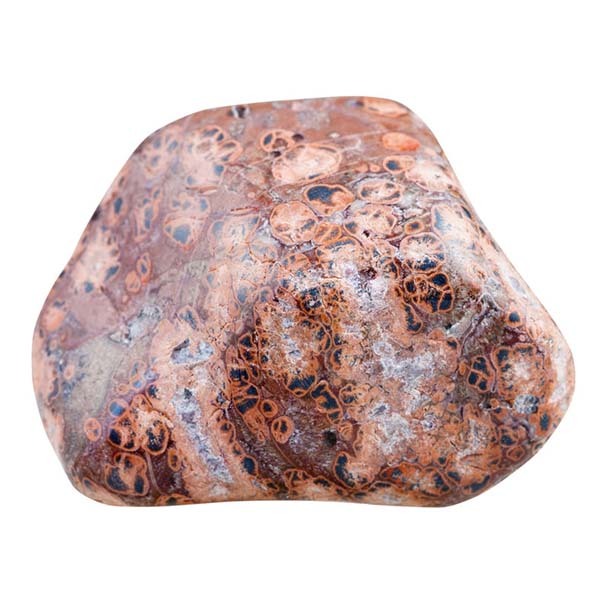 Leopardskin Jasper has been used to treat organs and glands that are experiencing a regulatory disfunction. Placing it on the affected area can help improve its regulatory action in the body. It has been found to be very helpful for the organs and glands like the brain, heart and pituitary gland that regulate our body functions. 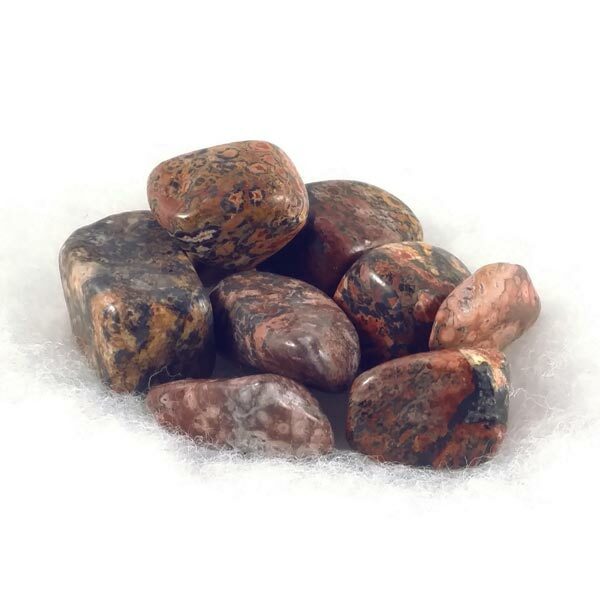 Leopardskin Jasper has a special affinity with those who are Capricorn. It carries a Receptive Energy, its Planet is Mercury, and Element is Air. Leopardskin Jasper has been worn for protection against drowning. In a book by Cunnigham, he has noted that it is especially potent for that purpose when it has been carved with the image of an equal armed cross. This image was made to represent the powers of the four elements, of foundation and of control. Since I already know how to swim, I do not have direct knowledge of this myself. I certainly could not recommend jumping in the deep end with one of these in your pocket if you can't swim. Common sense should always come first when experimenting.